The identification of Orestes before King and Court. From an illuminated manuscript of Cicero’s De amicitia, in the French translation by Laurent de Premierfait. The parent manuscript of this large miniature appears to be a compilation of at least two of Cicero’s texts in the French translation of Laurent de Premierfait. 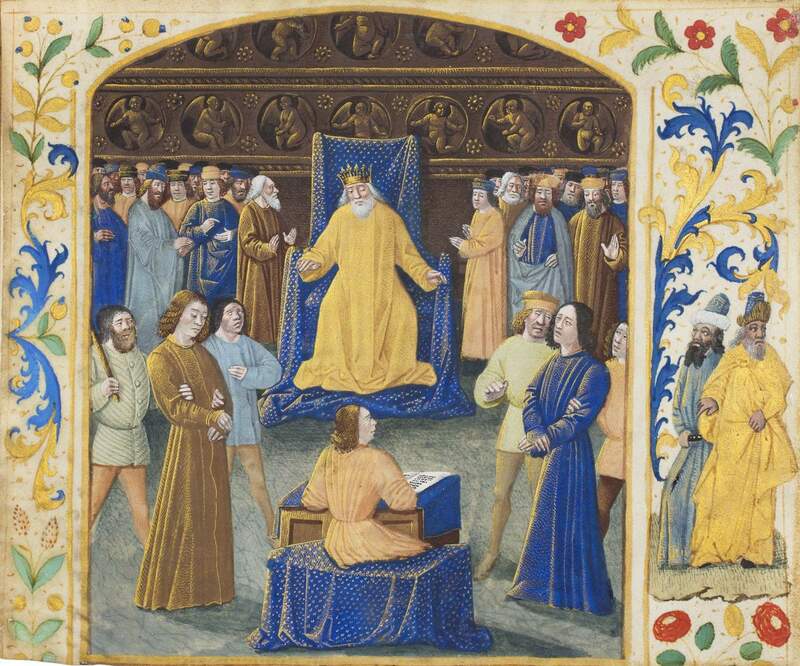 These textual assortments were popular in 15th-century French noble and scholarly milieus. While there is no established iconographic tradition for the De amicitia, the image evidently illustrates a passage in which Cicero describes the popular reception of a scene in a lost Pacuvius tragedy on Orestes and Pylades (Amic. 24). As the king condemns Orestes, each of the bound men asserts that he is Orestes in hopes of sparing the other from death. Although the outcome of the tragedy is unknown, the rare subject highlights the noble extent of the loyalty and selflessness of friendship.